On 17 November, the International Health Co-operative Organization (IHCO) and the International Organisation of Industrial, Artisanal and Service Producers’ Co-operatives (CICOPA) organised a conference entitled The Way Forward: How Industrial, Service, Health and Artisan Co-operatives Contribute to Development. 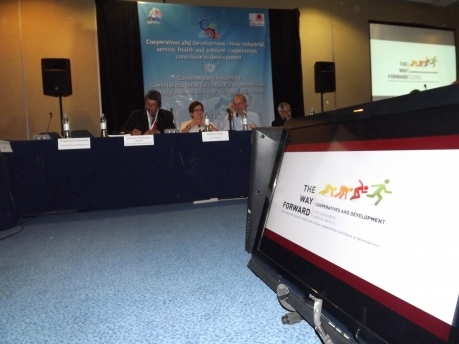 More than 200 people participated in the event, which was held in Cancun, Mexico as part of the General Assembly of the International Co-operative Alliance (ICA) and structured as a roundtable of 30 experts on development cooperation policies and projects. Representatives from the United Nations, the UNDP, the Brazilian and Mexican governments, development NGOs, the International Federation of Trade Unions, co-operative organisations involved in development and various regional and sectoral bodies of the ICA openly debated relevant topics related to the co-operative movement’s contribution to development. 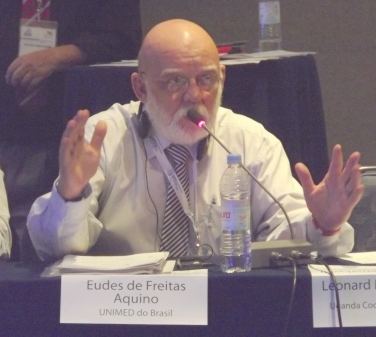 Dr. Eudes Aquino and Mr. Shuitso Hino, IHCO’s vice-presidents, also take part at the conference. The President of the ICA, Paulinne Green, who opened the conference, praised the IHCO and CICOPA initiative and stated the importance of the role ICA sector organisations play as drivers of co-operative development. Green also emphasised that international development is one of the crucial topics that the co-operative movement should closely follow and defended the need to intensify its efforts worldwide and define a global profile. After contributions by governmental and United Nations representatives, the debate revolved around three blocks: the micro level in relation to individual co-operative enterprises’ experiences, the meso level which refers to the mutualisation of resources through supporting institutions, financial instruments, co-operative groups, etc., and the macro level, reserved for national and international topics such as the legal framework or inter-cooperation between co-operatives. Each one of the three blocks was illustrated by a video presentation on how co-operatives contribute to development in the aforementioned three levels with specific case studies, followed by debate among the experts. The Espriu Foundation was presented in the meso level block as an illustrative example of health co-operatives. Some of the most relevant ideas that came out of the debate emphasized not viewing the decline of the economic system as inevitable, but rather as an opportunity to implement the co-operative values of solidarity and mutual responsibility, working together to build a better world. Co-operatives offer people the opportunity to have an active role in economic, social and environmental decisions through jointly owned and democratically controlled enterprises. Another aspect that focused the debate was the need to promote inter-cooperation to support co-operatives that can create jobs and generate wealth in less developed areas of the world. In this sense, it is also important to gather resources within the co-operative movement and seek support from governments to work on fostering new co-operatives that favour development. At the end of the conference, the roundtable participants drew up an agenda of the main points to be included in development policies on all levels such as the importance of promoting cooperatives through legislations based on the cooperative identity and standards, the importance of fostering a strong public policy for the development of cooperatives, the promotion of a more democratic governance by stakeholders in economic activities and the importance of sustainable long‐term employment for development.